MUSYSIC's audio engineers have specifically designed the new MU-Series power amplifiers to be perfect companions to the popular Club Series loudspeakers. To achieve this, they made sure that the amplifiers are capable of delivering power that matches the power handling capabilities of the Club Series Speakers, and equipped them with ATR (Accelerated Transient Response) technology for ultimate punch and clarity to deliver a signal that will result in optimum system performance. Each MU-series amplifier is equipped with this specially designed circuit so that it delivers output tailored to the specific response of the Club Series speakers. All models feature both XLR and 1/4-inch TRS inputs, and Speakon, Banana binding post outputs. High performance with exceptional efficiency, sweepable high and low pass filters for matching output to any loudspeakers, a compact and durable 2U chassis, and variable speed cooling dual fans. 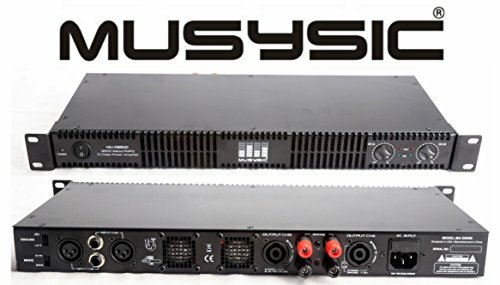 Stereo Output Power: "2x4800W PEAK, 2x2400W Program, 2x1200W RMS @ 2Ω" "2x2400W PEAK, 2x1200W Program, 2x600W RMS @ 4Ω" "2x1200W PEAK, 2x600W Program, 2x300W RMS @ 8Ω"
Bridge Output Power: "4800W PEAK, 2400W Program, 1200W RMS @ 4Ω" "2400W PEAK, 1200W Program, 600W RMS @ 8Ω"
Controls Panel: the power switch, channel 1 and channel 2 channel gain control; After the board: working mode, pressure limit./ lndicators Panel: the power switch, channel 1 and channel 2 channel gain control; After the board: working mode, pressure limit./ Amplifier Protection With short circuit, overload, overheat, cut peak pressure limit, dc, soft start, relay zero current switch, super audio and radio frequency protection device.